The Fellowship was fortunate enough to obtain a copy of STRANGE FRUIT #1 from BOOM! Studios. J.G. Jones and Mark Waid write, and Jones draws and colors. In 1927 the Mississippi River flooded, doing untold damage to the region and its inhabitants. The town of Chatterlee is on the banks, and it’s still raining. The townsfolk are doing everything they can to save their town, but given the time period there are stresses at work, including an active Klan cell and problems with the workforce. But now something has fallen out of the sky, and no one has any idea what effect it will have on this town already stretched to the breaking point. This is a story that’s rife with fear and anger, and given the setting it’s hard to see how it could have a happy ending (and if they got the title from the Billie Holiday song, even more so). Chatterlee (a fictional town) is under a tremendous amount of strain, and the “visitor” is a lit match thrown into the kindling. Erosion might be the best word to describe the theme of this book (which I’m hesitant to do based on one issue), and it is multilayered. And the art is amazingly emotive throughout. This might be a controversial story (and that might be an understatement), but it is certainly a powerful one. I’m looking forward to seeing the whole story play out, and hope that you will too. 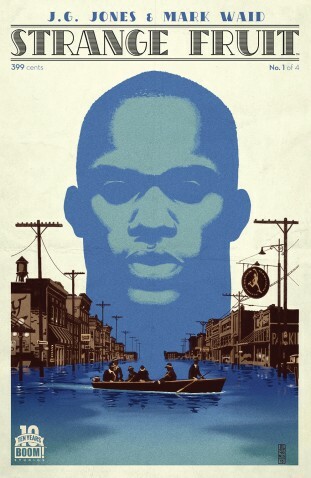 STRANGE FRUIT #1 is available now at your FLCS or at boom-studios.com.